Review of "90's Playlist Anthology"
I don't tend to read many anthologies because the stories featured are usually too short for my taste, and when I do read them, it is because at least one of the authors is someone whose work I've read and liked. That was not the case with this book. 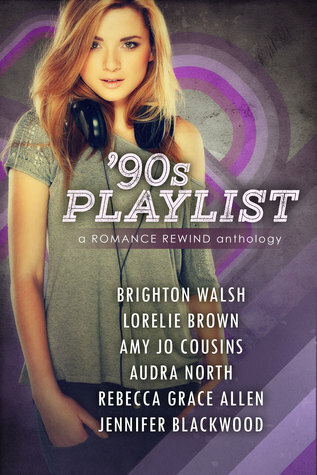 I received 90's Playlist Anthology as an ARC through, Brighton Walsh, the author of the first novella in the book. I loved the idea that these are all stories that take place some time in the 1990's and are based around a specific song from that time period. Basically, I wanted a reason to play my 90's playlist and this book gave it to me. If is the first installment and I enjoyed it more than I thought I would. It is told in first person, switching POV from Tia, the heroine, and Mason, the hero. Tia considers herself to be a bit of an outcast--if this took place in the present, she would probably be considered Emo. She wears all black, has body piercings, and is a film geek. Mason is her total opposite. He's the star quarterback for their college football team and the Vice President of his frat. He knows that if he's seen with Tia that it would blow his chances of making President. Lorelei Brown's Creep confused me. There were a few things that bugged me and I wonder if this is meant to be a prequel to another story she's written. Our main characters are Roni and Tom. Roni wants to feels special and thinks that Tom can do that for her, but she's not sure if the only thing he wants from her is help in finding his brother, Corey/Skittles. As for Tom, we never really learn what it is he wants. If this story is more than 50 pages, I'll be astonished, especially since it seems as if you're only at the beginning when it just ends. I felt as if there should be a big TO BE CONTINUED stamped on the last page because nothing is wrapped up--not the relationship between Roni and Tom and not the truth of what is going on with Skittles/Corey. I don't know what to make of The Belle vs. the BDOC; there doesn't really seem to be a plot. From what I was able to get based off of the two chapters I read, Shelby wants to get in Florence's pants because she dresses like Annie Hall and reminds her of a character from Steel Magnolias, but Florence is convinced that Shelby is straight and doesn't want anything to do with her. Trivia Night at the local bar is a big thing for both of them and Shelby decides she needs to beat Florence to put her in her place for not wanting her. I really liked Worthwhile, although it really didn't feel like it took place in the 1990's. There were mentions of Cher Horowitz style platforms and babydoll tops, but that was really about it. Anyway, Jill has just started a semester long study abroad program in the UK and wants nothing more than to go home to Pennsylvania because her boyfriend of two years broke up with her almost immediately after setting foot on English soil. Stuart is a nice guy, going through a rough time. After a meet not-so-cute, the two start spending time together and come to care for each other. Smells Like Teen Spirit perfectly matches the song its named after--Rory is lonely. She's working a dead end job in a town that is mostly filled with college students. She watches all the happy undergrads and wishes for the life she used to have, knowing that she could never get it back exactly as it was. One night, she meets James. He's two years younger than her and a student at her alma mater. He's a nice guy with impeccable manners and she's thoroughly attracted to him. The way she feels scares her because she's been hurt and doesn't want that to happen again. Little Red Thong takes place during Spring Break 1999, which is a bit of a problem, considering the fact that Sisqo's The Thong Song wasn't released until December of that year (it wouldn't be a big deal if it wasn't mentioned several times in the story). As I read, I distinctly remembered hearing it on my walkman (ok, my dad's walkman that I stole some time in the mid-90's) while on a bus to Six Flags with my 8th grade class in June of 2000, and hearing the DJ on Z100 saying it would be the Song of the Summer of 2000. Maybe the characters are time travelers? Emily is almost done with her BA from Stanford and has just scored 4 free tickets for a cruise to Mexico, so she, her brother, and a couple of their friends take off for some fun in the Mexican sun. After all, she'd be starting her 1L year at NYU in the fall. Chase has known Emily his entire life and has been in love with her for just as long. He sees the cruise as his last chance to tell her how he feels. 90's Playlist Anthology is currently available for Pre-Order and will be released on October 13th.